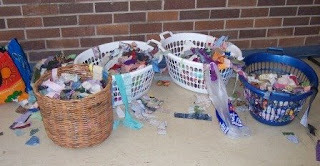 The stripping day at Toowoomba Quilters went very well, but I'se so tired now. Hubby could not understand how one could be tired after a day of fun! It was a big day though, organizing tables, refreshments, sewing, talking etc etc. All the girls (and 1 x fellow) made some glorious blocks and I can't wait to see some of the quilts finished. 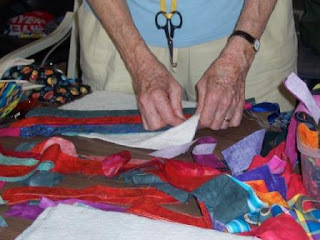 "Random" was the buzz word for the day, and I couldn't believe just how random some of the quilters were, some going out of their comfort zone, as they grabbed at whatever strip fitted across their block, taking no heed of the colour, pattern etc. Funnily, even though they were selecting at random, their blocks took on a particular look e.g. bright funky colours, country style muted colours etc, obviously reflecting their fabric inclinations. One lady surprised me and was soooooo random, even using some wonky looking strips (obviously cut by someone who had partaken of a few glasses of wine), when I know she does the most beautiful precise work and makes wonderful quilts. It was great to see our one and only male member of TQ (Alton) participate and give his sewing machine a good old workout - he has been unable to sew much lately due to harvesting on his farm. He was joined by his wife and they sat and sewed together and chatted and he gave us girls a bit of cheek every now and then. Maybe the family that quilts together stays together. Can't see my macho hubby having a go though. Then again, I wouldn't climb ladders and climb through roofs playing with electrical wires either. Some of this strips - they got much messier as the day went on. On a mission! Love those brights. And even brighter!! What's this? Pinning?? Surely not! Cheeky Caity even has strips in her hair. 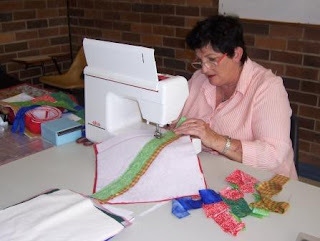 We are very lucky at Toowoomba Quilters to have the most wonderful venue. It is light, airy and pleny of space to move. Altogether we had 17 sewers, and really it was still quite comfortable. Unfortunately I ran out of puff at the end of the day and didn't get any more photos of blocks as they auditioned them, but please go to www.toowoombaquilters.org and Caity may have posted more shots there. 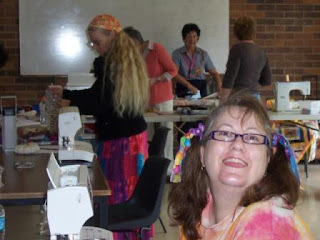 There wasn't much sewing done at my machine, but I spent very happy hours socializing! 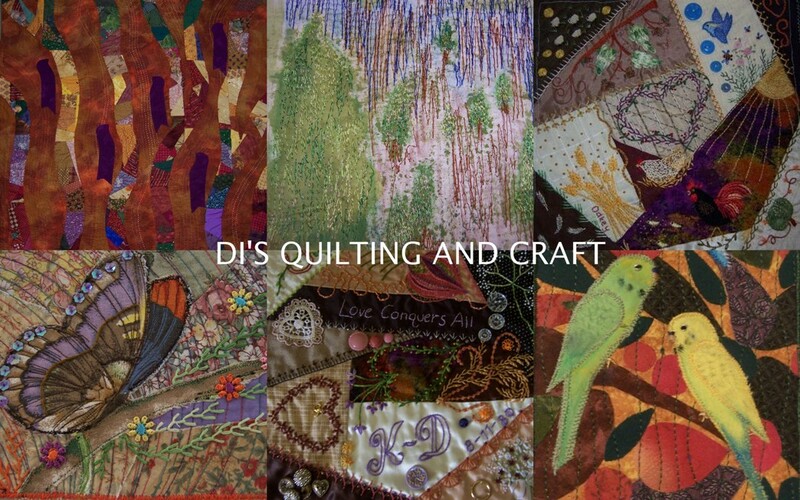 Di - Thanks for organising a great day out - it is amazingly good for the soul to sit and sew all those straight lines without a thought or care. I am with you on htat Sue. I had a great day and hated to leave to go to work. Many thanks to the organisers and i hope we have many more of them!